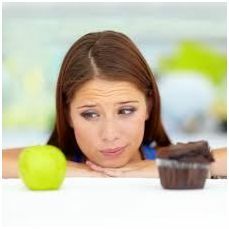 Are Toxic Thoughts Thwarting Your Weight Loss? The Festive Season is well and truly over, the kids are back at school so now is the perfect time to take on the challenge of losing those extra kilograms. You know you need to do it, yet do you feel that you are still struggling to make a dedicated effort to lose weight? It may be that your body is ready to lose weight, but your head is talking you out of it. This week, we will talk about how to stop negative weight loss thoughts in their tracks so you can get on and shed those excess kilos. The biggest problem is that some of us have lost perspective as to what a “healthy” amount of fullness feels like. If you have had a tendency to overeat, your ‘normal’ fullness means being stuffed and feeling sleepy, which is a sign of over-indulging. That means more healthy meals that result in feeling “just right” seem lacking by comparison. To overcome this, you have to address how you define appetite satisfaction. After you eat, you should feel physically well afterwards, like you could go dancing, or for a long walk. You need to redefine your former notion of “satisfied” as excessive. When “balanced” is your new “satisfied” you won’t want to overdo it. Believe it or not, it is often quicker to prepare a healthy meal than it is to wait for your order at your favourite takeaway. It is simply a matter of having the right ingredients available: for example, a bag of mixed greens with a can of tuna in olive oil & a splash of balsamic vinegar is a great healthy lunch and would take you less than 2 minutes to make. The key is to ensure you have the ‘makings’ for healthy meals in your pantry / fridge: there should always be vegies in the crisper (that are washed and ready to use), fruit in your bowl and lean protein in your freezer and pantry (such as cans of tuna). You may be stuck in the classic comfort eating pattern that goes something like this: ‘I feel sad / angry / annoyed so therefore I eat’. Eating may temporarily make you feel better but really, all comfort eating does is make you feel ‘worse’ about the way you look and therefore perpetuates the comfort eating cycle. You need to recognise the emotional triggers that cause you to eat ‘bad’ food and replace the behaviour: it may be taking a walk in the park, or making a phone call to a friend. Stopping comfort eating is not easy but you can ‘train’ yourself to deal with your emotions in a much more healthy way. If you are overweight and need help to kick off your 2019 weight loss resolution, you need to see The Natural Way today! Call 1300 SLIMMER (1300 754663) now, and make a FREE appointment to talk to your The Natural Way consultant about your weight and health goals. We know we have a lifestyle friendly program can be tailored to suit your needs. Mail Order (Ph Cora: 0458 754 663). We can help you to get back the body you want!